Minimal and modern, Greenington’s new versatile Rosemary side table offers a lot of function for it's diminutive size. The open base allows easy access to pull the table close. 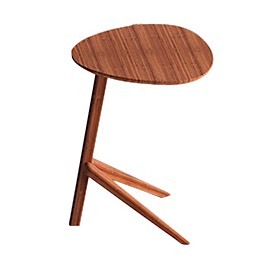 Available in classic caramelized bamboo, the Rosemary is a fun little accent table to hold your remote, snack, or even your laptop! Crafted in 100% solid Moso bamboo; 20% harder than Red Oak.